Wixom, MI — Trijicon products are world-renowned for their ruggedness and absolute reliability. After all, our Nation’s warfighters have depended on them for nearly 20 years. New for 2013, Trijicon has added Nickel Boron plating to select ACOG and RMR models. This exceptionally durable plating process provides a distinctive new look and serves as the ultimate in abrasion resistance with protection from extreme use and harsh conditions. The Trijicon ACOG is a compact telescopic sight with a tritium-illuminated reticle for use in low light or at night. It also utilizes the Bindon Aiming Concept (BAC) by way of a bright daytime reticle that uses advanced fiber optics to collect ambient light. 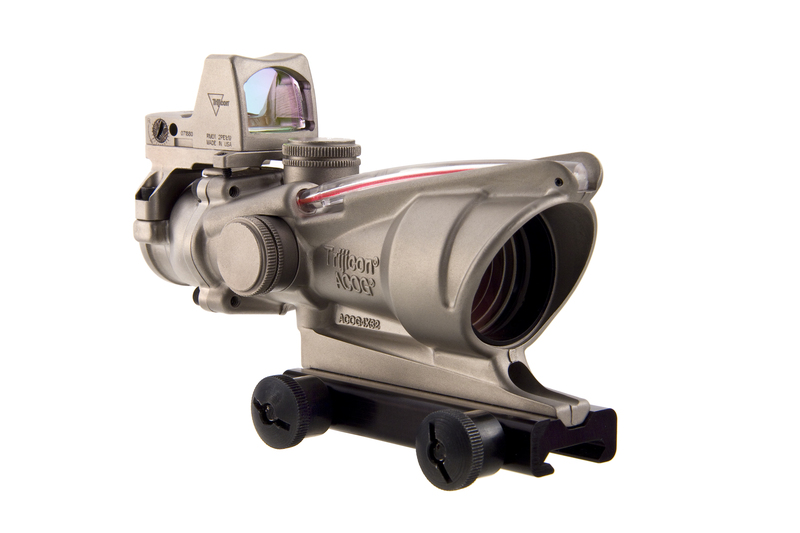 In this way, ACOG combines precise, distant marksmanship with close-in aiming speed. Every feature of its mechanical and optical design was chosen for a single purpose: to provide increased hit potential in all lighting conditions. The Trijicon RMR (Ruggedized Miniature Reflex) is highly regarded for its ability to provide fast, both-eyes-open target acquisition and accurate aiming with any style or caliber of weapon. Perfectly suited for combat, personal protection, competition or hunting, the RMR has quickly become the choice of experienced shooters who demand superior performance from reflex-style sights. For more information on Trijicon’s new ACOG and RMR optics featuring Nickel Boron, and the complete array of Brilliant Aiming Solutions™ for the hunting, shooting, military and law enforcement markets, contact Trijicon®, Inc. at (248) 960-7700 or visit www.trijicon.com. Wixom, MI — The recently introduced 300 AAC Blackout cartridge has rapidly gained acceptance from the nation’s tactical, competition, hunting and personal defense communities. This extremely versatile cartridge is capable of providing both supersonic and subsonic velocities that result in vastly different performance characteristics. New for 2013, Trijicon has provided a Brilliant Aiming Solution for this unique platform – the Trijicon ACOG® 3×30 with 300 AAC Blackout reticle. The Trijicon ACOG 3×30 with 300 AAC Blackout reticle is a fixed power, self-luminous tactical sight for professional military, law enforcement and personal use. Powered by Trijicon’s patented fiber optics and tritium-based technology, the 3×30 model incorporates a battery-free illuminated reticle, a ballistic drop compensator (BDC) for both supersonic and subsonic rounds and features the Bindon Aiming Concept (BAC)—a revolutionary both-eyes-open method of aiming. Utilizing standard 16 inch barrel velocities, the 300 AAC Blackout reticle is designed to be calibrated with supersonic (115 gr.) ammunition: Zero the scope at 100m using the center of the crosshair. The bottom tip of the crosshair serves as the 200m supersonic aiming point. The ballistic drop compensator (BDC) stadia lines represent the supersonic hold-overs for 300m, 400m, 500m and 600m. To aid in ranging, the width of the BDC stadia lines represent 19” at the specified distance. After zeroing with supersonic ammunition, the top and bottom diamonds serve as the subsonic (220 gr.) aiming points for 50m and 100m respectively. The top diamond serves as the aiming point for targets from 0-50m. For more information on Trijicon’s new ACOG 3×30 with 300 AAC Blackout reticle, and the complete array of Brilliant Aiming Solutions™ for the hunting, shooting, military and law enforcement markets, contact Trijicon, Inc. ® at (248) 960-7700 or visit www.trijicon.com. 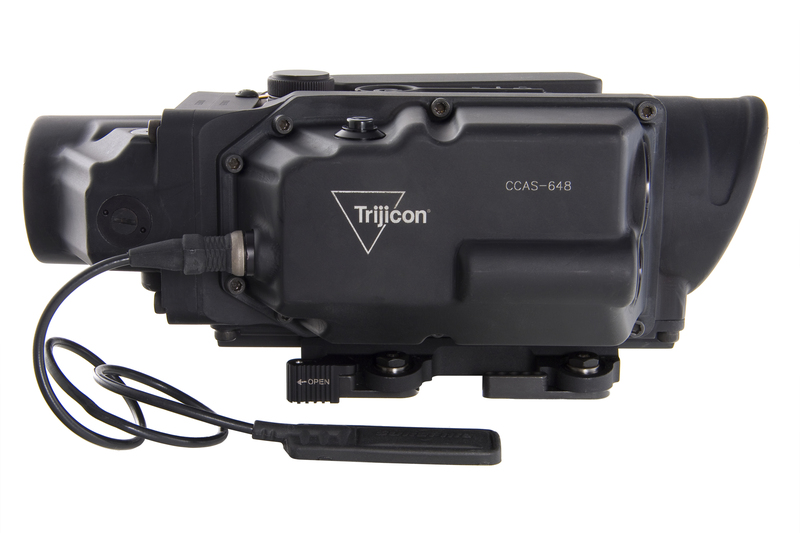 Wixom, MI — Trijicon’s new CCAS (Continuously Computed Aiming Solution) is designed to support a multitude of weapons systems ranging from vehicle mounted machine guns, infantry weapons to sniper rifles. The CCAS greatly expands a warfighter’s ability to quickly identify and engage targets by eliminating the cumbersome and time-consuming process of ranging, gathering and entering environmental data and generating a firing solution with a PDA. The CCAS has ranging capability out to 2,000 meters and gathers environmental and weather data including temperature and atmospheric pressure. In just half a second after activation, the onboard computer generates a firing solution using the most advanced ballistic programs available and displays an aiming point on the green reticle. This includes computing leads for moving targets. If the warfighter can see the target through the high-quality, 6X optic, he can hit it. Operators simply have to select their weapon and ammunition type from an extensive list of common weapon/ammunition combinations in U.S. military and NATO inventories, zero the system and CCAS does the rest. Set up, zeroing and operation are simple and intuitive. Power is supplied to the unit by four, commonly available CR123 batteries. First-round hits on targets allow soldiers, sailors and marines to dominate the battle space and save lives. In the frantic, fast-paced world of the battlefield, coming up with a firing solution for distant, fleeting targets was the near exclusive domain of specially trained sniper teams or squad designated marksmen equipped with special weapons, laser rangefinders, ballistic computers and weather centers. The Trijicon CCAS integrates all these tools into one optic and puts long-range, first-round hits on moving targets within reach of the average infantryman armed with standard individual or crew served weapon systems. The CCAS is a force multiplier, making the warfighter faster and more lethal. Wixom, MI —The Trijicon TARS (Tactical Advanced Riflescope) has received the 2013 NRA Golden Bullseye Award for “Optic of the Year” from American Rifleman Magazine. The Trijicon TARS is a 3-15x variable magnification, 50mm-objective, illuminated-reticle optic designed for tactical and sporting rifles. Premium-grade optics, exact adjustments, and innovative reticle systems allow users to engage targets at extreme ranges. Best-quality Schott glass is fully Mil Spec multi-coated to allow maximum light transmission. Advances in optical engineering have produced a generous 3.3 inches of constant eye relief while decreasing overall scope length to 13.9 inches. 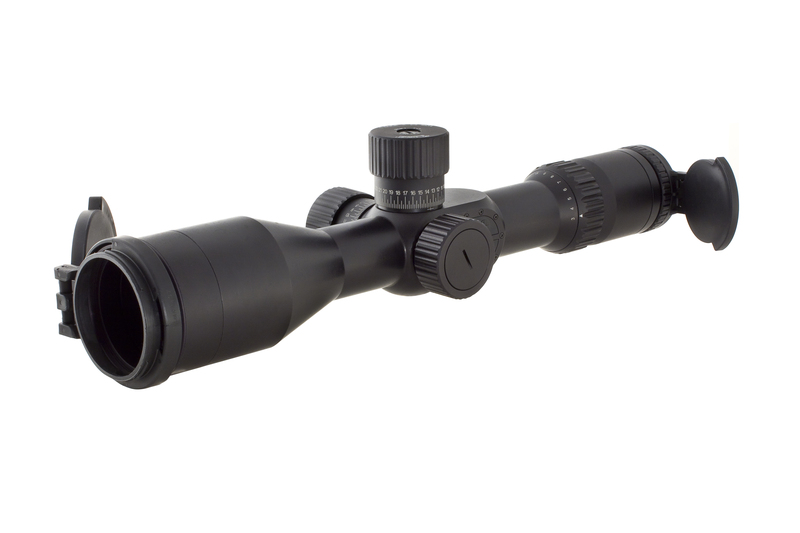 Its 3x to 15x magnification range make it a viable choice for myriad applications, from LE and military operations to benchrest competition to varmint and big-game hunting. The TARS features an innovative illuminated-reticle system with 10 levels of intensity, including two for use with night-vision optics. 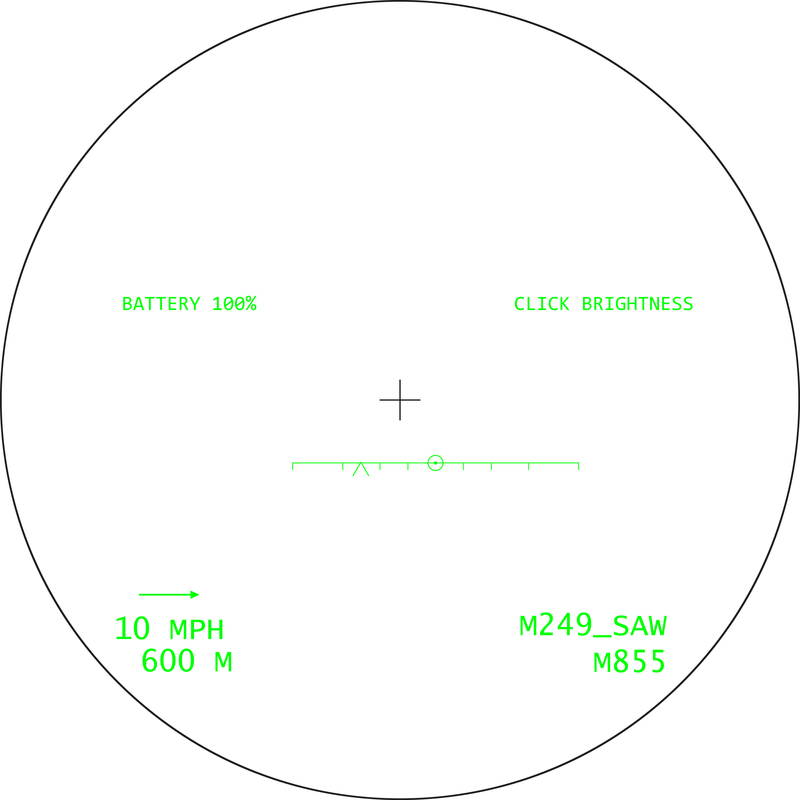 Its non-forward emitting LED illuminated reticle is much more efficient than current systems; One CR2032 battery provides up to 175 hours of use (setting 6, Day 1). Three reticle choices are available—an intuitive MOA reticle (Model 101), Trijicon-exclusive JW mil reticle (102) and a duplex reticle for traditional hunting applications (103 and 104). All are located in the first focal plane, so subtension values remain constant across the magnification range. A robust, 34mm main tube machined from aircraft-grade aluminum combined with Trijicon’s mil-spec construction ensure TARS can handle severe recoil in the harshest environments. It is waterproof to 66 feet. Hydrophobic coatings on exposed lenses ensure clarity in wet conditions. Finger-adjustable turrets feature patent-pending lockable, tactile click adjustments for positive tracking and repeatability. A side-mounted parallax dial focuses from 40 yards to infinity. Removable Tenebraex flip-up range caps and sunshade are included. NRA Publications will present its annual Golden Bullseye Awards at a special breakfast at the 2013 Annual Meetings & Exhibits in Houston, Texas on Friday, May 3, 2013. For more information on the Trijicon TARS™, and the complete array of Brilliant Aiming Solutions™ for the hunting, shooting, military and law enforcement markets, contact Trijicon®, Inc. at (248) 960-7700 or visit www.trijicon.com.